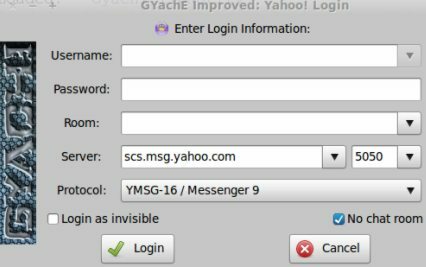 Gyachi application is a fork from Gyach Enhanced yahoo Client for Linux based operating system.Gyachi is based on yahoo instant messenger protocol.Gyachi’s user interface is based on GTK+ version-2 and it’s aim is to provide all the features that is available in windows yahoo messenger client.It has a lot of features like Voice-chat,nicknames,webcams,avatars,images and many more. On Ubuntu 10.04 you can either install it from Synaptic Package Manager after adding the Package address or from command line.Here both the methods are explained choose whatever you like. 1. Open Synaptic Package Manager and enter the login password(If asks). 2. Then click on Settings->Repositories->Other Software. 4. 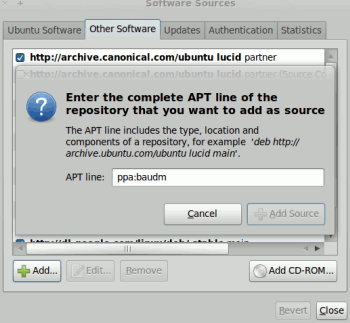 Next,close the current window and click on Reload button in Synaptic Package Manager. 5. Now,search for gyachi in quick search bar of synaptic package manager;Mark the box for installation(Select the dependencies by clicking on ok if necessary) and click on Apply to install gyachi.Installation will complete within a minute. 1. open terminal from Applications->Accessories->Terminal or hit CTRL+ALT+T. Open Gyachi – improved from Applications->Internet->GYachE Improved.